Brendon Grylls must be relishing his time as the most important person in Western Australian politics at the moment. The most impressive part is that none of what he’s on about is new; the pre-election profile that aired on Stateline before the election seems amazingly prescient now! And with John Bowler on his side, he commands five Legislative Assembly votes — enough for minority government with the Libs, or a majority with an apparently fragile Labor. So much for the old predictions that one-vote-one-value would destroy the Nationals and cement the big parties! Also, what’s up with all the criticism of the WAEC from pollies? They’re taking just as long to finalise the vote count as they’ve done for every previous election I’ve seen, but just because Labor couldn’t win government this time means there needs to be an inquiry?! Remember how, during the election campaign, it often seemed that Team Ruddster wasn’t really that different to Team Howard? It certainly sounded that way this week, with the Defence Minister promising that spending levels won’t change, the Foreign Minister promising to keep the American alliance strong and the Human Services Minister promising yet another crackdown on people receiving Centrelink payments. In Perth, oh look, the CCC has claimed another scalp! But this time it’s the super-high-profile boss of the WA Health Department, Neale Fong. In honesty I wasn’t nearly as impressed by his performance in that job as the Health Minister seemed to be, and so I’m not exactly sad to see him go. Shock, horror, demand at Perth Airport continues to grow. Meanwhile, the owners are still stuffing around with barely-adequate carparks ever further from the run-down domestic terminals. But then THE LATHAM BEAST reared its ugly head. Team Howard says this is proof that Labor intend to backflip once elected, and if they’re to pull a rabbit out of their hat this election, I think a scare campaign along these lines may be their best bet. So it’ll be interesting to see if this story disappears as quickly as the other scandals of the campaign have. In true Latham style, there’s a kernel of truth in what he’s written — the big announcements from each party really haven’t been far off identical. But then, how does that differ from the 2004 election …? Liberal on the left: not so trustworthy. Liberal on the right: he’s your best mate! 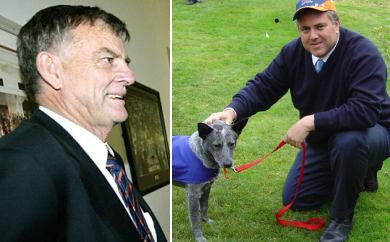 I was somewhat disappointed by the apology from Bill Heffernan on Wednesday — not because he was doing it grudgingly, his hand clearly having been forced by Johnny, but because it means the crazy NSW senator will be silenced for at least a couple of weeks. You see, the other bits of his interview in the Bulletin revealed just how much time he spends thinking about being horny. So I was looking forward to all-new slurs being thrown at other Labor figures — we could have heard how Senate leader Chris Evans doesn’t understand the average Aussie because he supports the Dockers (real men root for the Wagga Brothers!). Or maybe environment spokesperson Peter Garrett could’ve been cut down to size with a reminder that the people of Australia will never trust a man who waxes his head. Instead, the Heff’s been pushed aside by last night’s announcement from that big bear of a man Joe Hockey: WorkChoices will be made slightly kinder and gentler. Even though this’ll quite nicely blunt criticism from Labor and the unions, it doesn’t constitute bowing to public pressure, oh no. It’s just that Honest John found some places where his flawless IR policy needed a “stronger safety net”. First the scramble to replicate Labor’s broadband policy (which hasn’t yielded anything yet), and now this. So it seems that what we have a new strategy from the federal Liberals: just photocopy Labor’s press releases! But on closer scrutiny, I’m not so sure that spending billions of public dollars to cover the country with fibre to the node is the best way to go about fixing the problems in Australia’s broadband. After reading Joshua Gans and Ross Gittins, I’m thinking it’s a step in the right direction, and way ahead of what we’ve seen from Howard so far, but also not the best possible decision. I quite like Mel’s term “the Ruddster”, and thus it shall henceforth be the official name of the Federal Opposition Leader on this blog, by pseudo-Royal decree. So. Sunday’s announcement about “clean coal” — basically, the Ruddster wants to mirror-without-mirroring the Government policy of pumping money into coal power plants using technology that isn’t archaic — struck me as somewhat of a grand compromise, in that it tries to placate Peter Garrett’s crowd (look! it says ‘clean’!) while keeping unions happy. Indeed, this is the only pattern that stands out to me when looking over his announcements from the last few months: he sticks to the centre of the playing field, doesn’t do anything all that radical or offensive, and he bends over backwards to keep everyone more or less on his side. I wasn’t old enough to ever witness Bob Hawke in action, but “The man who can bring business, government, and the unions together” was a pretty nifty campaign slogan, and the Ruddster seems to be inspired by it. This isn’t necessarily a bad thing — heck, if Rudd can keep some peace with conservatives, it’ll save us from the divisive time we’ve had under Howard — but it also means that if he wins the election, I won’t be expecting any ground-breaking new policy direction from him. There may be an exception in the realm of foreign policy, what with the Ruddster being a former DFAT employee and all, but so far he’s been singing a pretty similar tune to past Labor leaders. Maybe this is part of the whole plan: don’t come across as a loose cannon, keep people sympathetic (or at least tolerant), and then rely on the nerdy charm to win over voters!